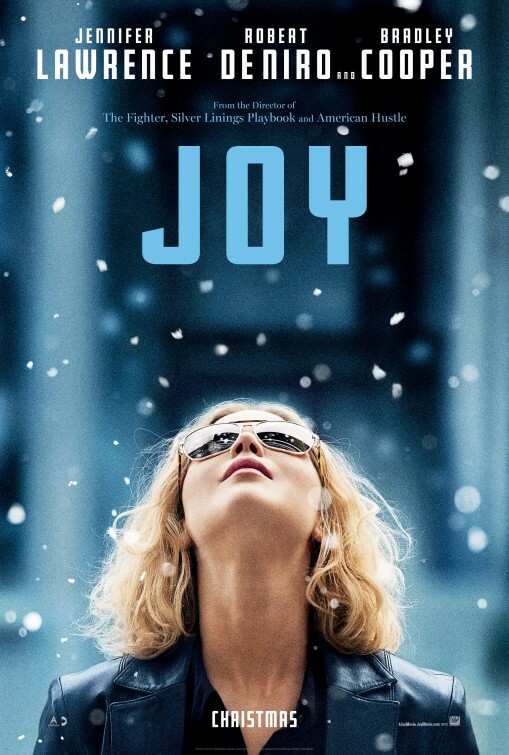 Review: The good news to report about Joy is that it’s eons better than American Hustle, the last film that teamed up director David O. Russell with Jennifer Lawrence, Bradley Cooper, and Robert De Niro. The bad news is that, like American Hustle, it’s largely a watch it and forget it kind of experience with only Lawrence’s performance lingering in the memory after the credits have rolled and the lights have come up. Working with the same three actors for his last three pictures, one could argue that Russell is gathering a bit of a cinematic repertory of talent that he finds a way to plug into his films. That’s an interesting concept and one I’m not totally opposed to, but the problem arises when the roles being offered to these stars don’t fit them, forcing them to be the square peg valiantly sucking in their guts to fit into Russell’s round hole. Touted as being “loosely” based on the life of Joy Mangano (c’mon Russell, it’s either based on her life or it isn’t…you can’t ride the middle ground), Joy is all over the map when it comes to its narrative. Much of the movie is recounted by Joy’s grandmother (a divine Diane Ladd)…except when it’s not. Long stretches of the movie go by without the grandmother’s guiding voice so the narrative device becomes a tool to assist in transitions when simple filmmaking alone can’t do the trick. Mangano’s life plays like an ‘80s sitcom: she’s a divorcee living in her mother’s house and her ex-husband (Édgar Ramírez, Point Break) lives in the basement. Her mom (Virginia Madsen) hides away from the world, losing herself in her soap operas (hilariously recreated by the likes of Susan Lucci and Donna Mills) and letting her daughter do most of the household upkeep. When Joy’s hot-tempered father (De Niro, Cape Fear) moves in after his longtime girlfriend kicks him out, the dynamic of the already erratic household is thrown into disarray. It isn’t until Joy winds up in the offices of upstart company QVC that the movie starts to take some kind of shape. Meeting the brainchild behind the business (Bradley Cooper, American Sniper), she’s encouraged to go big with her idea, leading to her becoming the first “real” person to pitch a product on the network. The scene where Joy first appears in front of the camera to demonstrate her Miracle Mop was the only time in the entire movie that I felt something magical was happening. That’s largely due to Lawrence’s ability to shed the skins of her previous roles and totally disappear into this woman. A relatively short scene, it’s stuck with me in the weeks since I first saw it. Sadly, the film reaches its peak at that moment and the rest of the time is spent tracking Joy’s bumpy ride to the top, complete with epic failures and miracle reversals of fortune. How much of it is actually accurate I couldn’t tell you but in the eyes of Russell and co-writer Annie Mumalo (This is 40) the journey is one of pure will and unflinching drive. The main issue I had with the movie is also the one thing that makes it worth seeing…Jennifer Lawrence. Though she’s entirely believable as a young mother looking to make ends meet, she becomes less successful as the years go by and her character has to move into the early stages of midlife. By the time we see her in a power suit and French manicure, all plausibility has left the room and it comes across as a great actress playing dress-up for her favorite director. I know Lawrence and Russell have a deep fondness for each other, but both need to see that there are limits to the roles they can work on together. The story being told here is interesting and the actors are attention-grabbing in and of themselves. Yet something kept everything from gelling in a way that made a lasting impression. Russell is known for his quirky tone and unexpected performances…it’s why Silver Linings Playbook worked so damn well…but his two follow-up films haven’t been able to latch onto that same magic.